The Jewish governor of Missouri, Eric Greitens, said he will volunteer to help repair a St. Louis-area Jewish cemetery where at least 170 gravestones were toppled over the weekend. Meanwhile, two Muslim activists have launched a crowdfunding campaign to raise $20,000 for repairs. The launchgood drive started by Linda Sarsour and Tarek El-Messidi had brought in $17,750 as of Tuesday afternoon. They said any remaining funds after the cemetery is restored will go to fixes for other vandalized Jewish centers. Greitens in a news release Tuesday cited the concept of “tikkun olam,” or repair of the world, and asked helpers to bring rakes, garbage bags, wash rags and more cleaning supplies. “My team and I will be there tomorrow, and I’d invite you to join us,” he said. “Disgusted to hear about the senseless act of desecration at the cemetery in University City. We must fight acts of intolerance and hate,” Greitens wrote in a tweet Monday evening after the vandalism was discovered. The attack on the cemetery took place sometime between Friday night and Monday morning, when the damage was discovered. 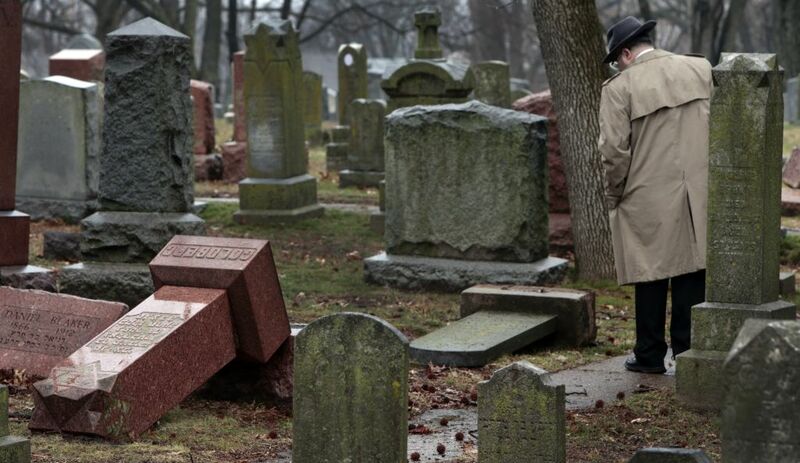 Chesed Shel Emeth Cemetery Executive Director Anita Feigenbaum told The New York Times that between 170 and 200 headstones were toppled, with some being broken and damaged. The headstones are in the cemetery’s oldest section, dating from the late 1800s to the mid-1900s, she told the Times. In an interview with the Huffington Post, Lt. Fredrick Lemons of the University City Police Department declined to classify the vandalism as a hate crime. “Right now, everything is under investigation,” Lemons said. “We’re looking into all possible leads.” The police are reviewing cemetery surveillance cameras, according to the report. Greitens, a former Navy SEAL whose military awards include the Bronze Star, was elected the first Jewish governor of Missouri in November. In an update Tuesday afternoon, the society said a local monument company had begun to replace the monuments on their bases. It said it would try to have a comprehensive list of the toppled monuments posted by Wednesday. A local church, the All Nations Church, launched an appeal to help repair the damage caused by the vandals. The church said on its website that it would match up to $500 in donations to the cemetery. Previous articleLe Pen backtracking on dual citizenship?